Synthetic peptide within Human CD36 aa 350-450. The exact sequence is proprietary. ab221605 is a PBS-only buffer format of ab133625. Please refer to ab133625 for recommended dilutions, protocols, and image data. Endotoxin level is less than 1 EU/ml as determined by the TAL test. Our Abpromise guarantee covers the use of ab221605 in the following tested applications. WB Use at an assay dependent concentration. Detects a band of approximately 78-88 kDa (predicted molecular weight: 53 kDa).Can be blocked with CD36 peptide (ab190596). We do not guarantee IHC-P for mouse species and did not test IHC-P on guinea pig tissues. The lysate in this image is prepared by 1%SDS Hot Lysate buffer. For Lysate preparation protocol, please refer to the protocol book in the protocol section and/or here (downloadable copy). This data was developed using the same antibody clone in a different buffer formulation containing PBS, BSA, glycerol, and sodium azide (ab133625). Ab133625 staining CD36 in paraffin embedded Human Hepatocellular cancer tissue sections by Immunohistochemistry (Formalin/PFA fixed paraffin embedded sections). Tissue was counterstained with hematoxylin and heat mediated antigen retrieval was performed using ab93684 (Tris/EDTA buffer, pH 9.0). Samples were incubated with primary antibody at 1/10,000 dilution (0.17µg/ml). A ready to use Goat anti-rabbit IgG H&L (HRP) was used as the secondary antibody. Positive staining on endothelial cells in human hepatocellular cancer. The expression level of CD36 varies in different samples, and it could be upregulated by treatments such as PMA and Porphyromonas gingivalis (PMID: 8576181 and 27234131). RAW 264.7 and mouse liver are reported to be positive for CD36 by PMID: 26187465 and 26186589, but this antibody failed to detect clear signal in normal conditions. Ab133625 staining CD36 in paraffin embedded Human cardiac muscle tissue sections by Immunohistochemistry (Formalin/PFA fixed paraffin embedded sections). Tissue was counterstained with hematoxylin and heat mediated antigen retrieval was performed using ab93684 (Tris/EDTA buffer, pH 9.0). Samples were incubated with primary antibody at 1/10,000 dilution (0.17µg/ml). A ready to use Goat anti-rabbit IgG H&L (HRP) was used as the secondary antibody. Positive staining mainly on endothelial cells in human cardiac muscle. Observed band size: 78 kDa why is the actual band size different from the predicted? Observed band size: 74 kDa why is the actual band size different from the predicted? Observed band size: 88 kDa why is the actual band size different from the predicted? This blot was produced using a 10% Bis-tris gel under the MES buffer system. The gel was run at 200V for 35 minutes before being transferred onto a Nitrocellulose membrane at 30V for 70 minutes. The membrane was then blocked for an hour using 2% Bovine Serum Albumin before being incubated with ab133625 overnight at 4°C. 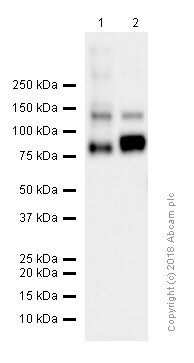 Antibody binding was detected using an anti-rabbit antibody conjugated to HRP, and visualised using ECL development solution. Observed band size: 78-88 kDa why is the actual band size different from the predicted? The lysate in this image is prepared by 1%SDS Hot lysis method. ab133625 (unpurified) at 1/5 immunoprecipitating CD36 in 3T3-L1 cell lysate. 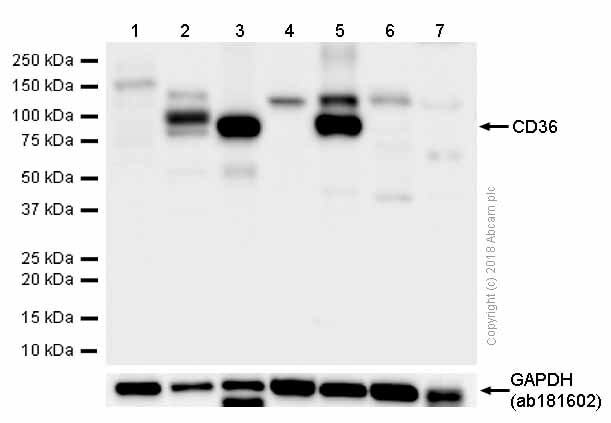 For western blotting, a peroxidase-conjugated goat anti-rabbit IgG (H+L) was used as the secondary antibody (1/1000). ab133625 (purified) at 1/50 immunoprecipitating CD36 in 3T3-L1 cell lysate. 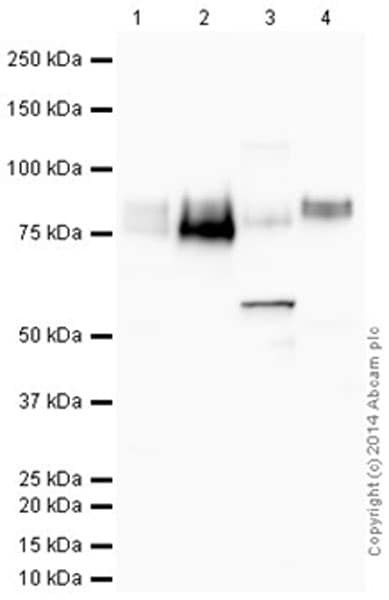 For western blotting, a peroxidase-conjugated goat anti-rabbit IgG (H+L) was used as the secondary antibody (1/1000). There are currently no Customer reviews or Questions for ab221605.